You are looking at a new gift set from Aveda. 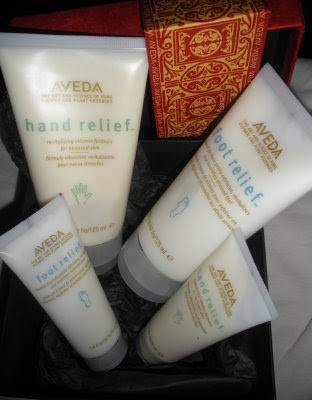 I already blogged about the Aveda hand relief lotion but I have yet to discuss the wonderful foot relief lotion. The foot relief lotion is great to smooth out your skin and keep your feet in tip top condition through these cold winter months. The key ingredients include castor oil, fruit acids, jojoba oil, lavender oil, and rosemary oil. This new gift set features the hand and foot relief creams in both the regular and travel sizes. These gift sets are sold at Aveda for $40, but it is how Aveda is giving back that caught my attention. In the picture you may notice the beautifully crafted paper with embellishments alongside the Aveda logo. Aveda has been working with the people of Nepal to create these gift boxes in an attempt to sustain some of the families in Nepal. The gift boxes are so cute that I am pretty sure I will reuse them :-). How are you giving back or how would you like to give back in the future? I wish I could this year. I've given back in the past but I'm cathcing pure hell this year for the most part. In the future, I would like to help out families that have hard times making it through the year...not just the holidays. That Aveda gift basket does look good though! Definitely do the food section. Oooh I love Aveda, and companies that give part of their proceeds to charity (MAC, e.g.) are fab!! Aww, yeahhh to Aveda! I love companies that love to give back. They need to drop the prices on some of their products so I can support them some more. Lol! I give back my direct help...volunteering at soup kitchens is my kind of thing. ;) Have a happy weekend! Thanks for your great comments ladies. Giving back year round is really important. Good job Aveda! And here I am thinking you were going to give us some Aveda products. LOL. There's a great organization that I'm affiliated with through my job. They provide assistance to families throughout the year. I typically donate 'scholarships' for the children to attend summer camp as well as donate funds for providing Thanksgiving dinner and Christmas gifts.